Beach BOOSTER Radio Podcasts - BEACH CORNER with Dianna Chycki - WAYNE BUTTERY - "GABOR AND FRIENDS"
BEACH CORNER with Dianna Chycki - WAYNE BUTTERY - "GABOR AND FRIENDS"
Be part of history with “Gabor and Friends” with over 700 years of musical experience on stage on Friday, December 7th at Collingwood Historic Gayety Theatre in support of the Collingwood G&M Hospital Foundation. Featuring a ten-piece all-star band with performances from singers such as Wayne Buttery, Stephen Cassini, John Finley, Lisa Hutchinson, Dean McTaggart and Connie Scriver. 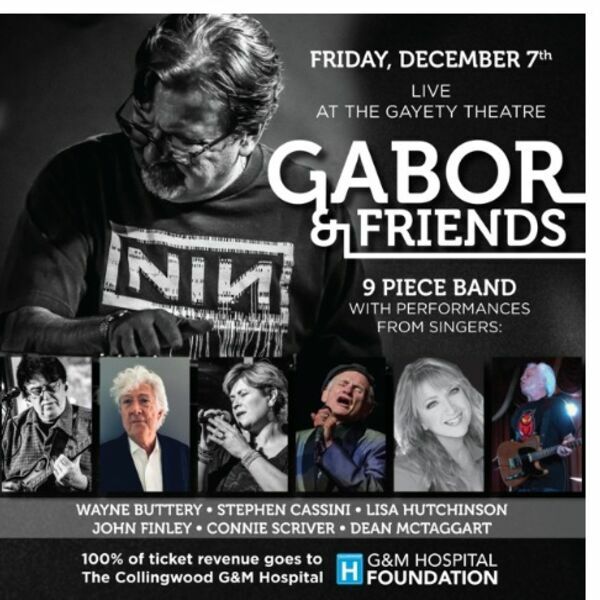 This is a fundraiser for the Collingwood G&M Hospital Foundation where 100% of all ticket revenue will support the hospital foundation. Joining Dianna in the studio is our very own Wayne Buttery. Wayne will share some of these amazing artists and musicians taking part in this fundraiser.